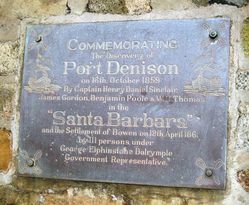 An obelisk commemorates the European discovery of Port Denison by Captain Sinclair and the crew of the Santa Barbara in 1859. The obelisk was unveiled on the 75th anniversary of the landing . 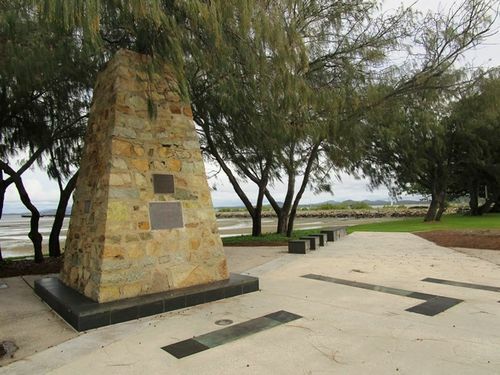 The plaque on the obelisk also commemorates the settlement of Bowen by George Dalrymple in 1861. The town of Bowen really dates back to 1859 when Captain Henry Daniel Sinclair sailed from Rockhampton in the 9-ton ketch Santa Barbara in search of a suitable port north of Rockhampton. He found a good harbour which he named Port Denison (after the Governor of New South Wales) and returned south to claim a reward only to find that Queensland was about to become a separate colony and neither the old colony nor the new one was prepared to reward his discovery. Bowen October 18. Today broke fine and hot and the rain seems to have departed for a while at any rate. A couple of nice little showers fell within the last 48 hours mostly on Tuesday morning and there was every indication of heavy rain upsetting the arrangement made for the unveiling of the obelisk in memory of Captain Sinclair, but fortunately the afternoon was beautifully fine, and a large crowd gathered on the foreshore to watch the interesting proceedings. The men who built the obelisk are to be congratulated on the very fine job they turned out and on the fact that they had it ready to time notwithstanding many vexatious delays. The bronze plate which besides two old-time caravels and other designs on it has, in each corner, what is known as the 'Bowen knot.' The design is the output of Mr. Hawkins' clever work. The monument itself is a plain stone obelisk. Townsville Daily Bulletin (Qld), 22 October 1934.